Royal Caribbean is once again changing our idea of what a cruise ship can offer with its soon-to-debut Quantum of the Seas in just a few weeks. But with this new ship comes arguably the most planning required to take advantage of this new ship and experience everything to its fullest. If you're new to cruising, here's what you need to know about this new ship. Before you ever step foot onboard Quantum of the Seas, Royal Caribbean is strongly encouraging all guests to plan ahead online. Using their new Cruise Planner online app, guests can make reservations for the new Dynamic Dining restaurants, shows, excursions and more. Royal Caribbean says you can wait to book these things onboard the ship but availability will be subject to if space is still available. That's a big if. Previous to the Quantum-class, online planning was available but not nearly as important as with this new ship. 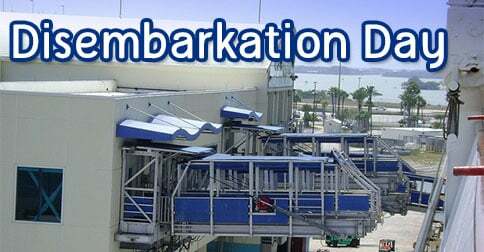 Checking into your cruise online allows you to upload a photo of yourself, set up your credit card and do everything you can now to skip the lines at the embarkation pier. In fact, you can pre-book what time you want to arrive to ensure you get from curb to ship in 10 minutes. With Quantum of the Seas we get our first taste of what Royal Caribbean is calling Dynamic Dining. Instead of a main dining room with set dinner times, there are a number of restaurants that you can choose to dine at. Some restaurants are included in the cruise fare while others have an additional cover charge cost. The concept is brand new to Royal Caribbean and it's a big push to get away from the formality of cruising's past. Once again, you are encouraged to book reservations in advance to avoid being locked out of the places you want to go to. Don't worry, there's still plenty of complimentary dining options as well as more casual fare, including a 24-hour buffet restaurant at the Windjammer Marketplace. There's a lot more new and really cool innovations on Quantum of the Seas but you're likely the ones we listed are the most noteworthy. Quantum of the Seas offers a number of different staterooms to choose from. It's always a good idea to know all the options out there, but Quantum of the Seas has even more new types of staterooms than any other Royal Caribbean ship. If you're cruising solo, there are brand new studio staterooms just for you. No more single supplement fee, these staterooms offer those going solo an affordable vacation choice. 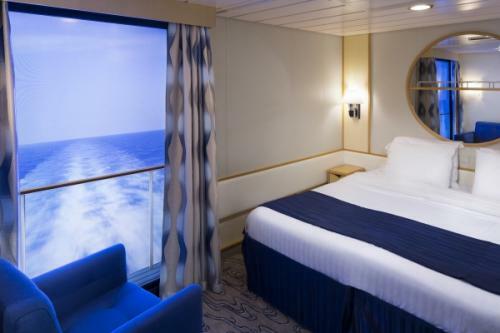 Also really different are the virtual balcony staterooms. Instead of a boring interior stateroom with no view, how about an 80-inch LCD screen that delivers live views outside the ship that mimic what a balcony would look like, including the sound! If luxury is your game, then check out the Royal Loft Suites that are two-story accomodations meant to wow everyone. If you're going to spend enough money to buy a used car on the cruise, this is the stateroom for you. If you're a veteran Royal Caribbean cruiser, what advice do you think is important for a first time cruiser to be aware of? Please share your thoughts in the comments! 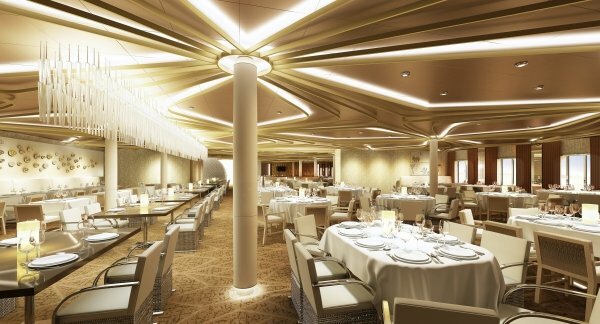 If you're new to cruising or just Royal Caribbean, dinner onboard may seem different than you're used to, so here's a guide to how dinner is handled in the main dining room on your cruise ship. There are two types of dinner experiences you can expect on a Royal Caribbean cruise. Which type you have the opportunity to get to experience depends on the ship you pick. 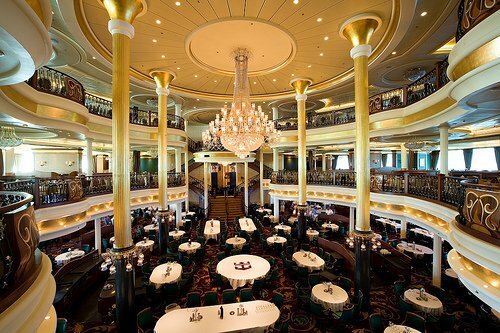 As the name implies, traditional dining is the classic means of experiencing dinner on your Royal Caribbean cruise. There are two seatings, first and second seating. First seating is usually around 6:00pm and second seating is usually around 8:00pm. Exact times will vary. When you book your cruise, you can choose which seating you like. Typically families choose first seating because it's harder to keep kids up later for the second seating. You will still see kids in second seating, but there tends to be more families in the first seating. You will be assigned a table in the main dining room that can be as small as two people or as large as 16 or even larger. Royal Caribbean can also place you at a table with other guests onboard your ship. Who you sit with (if anyone else) depends on a few factors but it's usually the norm to be seated with others. You can change your seating if you prefer not to sit with others or are unhappy with whom you are seated with. Speak to the head waiter to arrange a change, although changes are subject to availability. Once seated, you will be taken care of by your main waiter, assistant waiter, and to a lesser degree, head waiter. The main waiter takes your orders and brings you your food. Your main waiter is your primary point of contact and will do most of the serving. The assistant waiter is the head waiter's help and brings you beverages, bread and otherwise assists the main waiter. The head waiter largely manages the wait staff he or she is responsible for and can handle special requests. You may not see the head waiter that much but it's usual to have the head waiter visit your table once every night or two. Eating at the main dining room is a lot like eating at any restaurant at home in that you get a menu of appetizers, entrees and dessert and you can choose anything on the menu. In fact, you can order as much food as you want so feel free to get a few entrees and appetizers. My Time Dining is a lot like traditional dining with one big exception: you do not have a set time that is the same every night of your cruise. You will still dine in the main dining room, but you can choose between making reservations or showing up and waiting for a table. My Time Dining advertises its benefit as being you do not have a set time to eat each night. So if one night you feel like dinner at 6pm but another night you want to stay at the pool later, you can come eat at 8:30pm. Like the main dining room, you may be seated with other people at your table. Where you sit is subject to availability. Unlike the main dining room, you may not have the same wait staff each night. You can request certain waiters but you may have to wait to be seated at a table they serve. The my time dining experience once seated is nearly identical to traditional dining. You order off of the same menu as traditional dining and can order as much food as you like from that menu. Getting off your Royal Caribbean cruise to go home is without a doubt the saddest day of your vacation. No one likes it and even thinking about it is downright depressing but it's busy day so we wanted to discuss what you need to know about getting off your cruise to go home. Bring your luggage or let someone else do it? The first thing you have to decide is if you want to have Royal Caribbean bring your luggage off the ship and onto shore for you or if you want to bring your luggage yourself. Those that take their luggage on their own can get off the ship anytime they want once the ship has cleared customs. This allows for the speediest exit from the trip and for those that want or need to get going early, this is the best solution. Of course, taking your own luggage means you have to physically bring it from your stateroom, through the ship and onto shore. That's a lot of lugging, which may be too physically demanding for many. Luckily, Royal Caribbean offers a complimentary service where they will pick up your luggage the night before your ship returns and deliver the luggage to shore for you. Part of this decision is if you can physically handle taking the luggage yourself but the other part is what your plans are. If you have an early flight or a long drive, or just have plans and want to disembark early, taking your own luggage is the best option. If you have a little more time or want to enjoy a few mour hours onboard the ship, then let Royal Caribbean take your luggage. 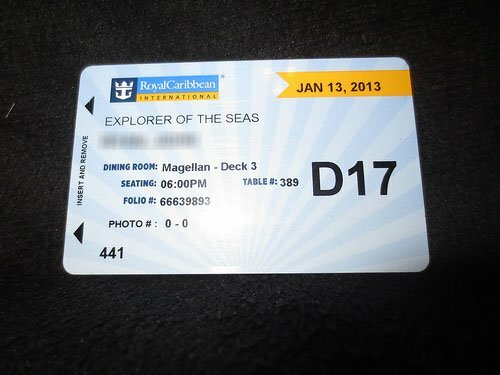 Royal Caribbean gives every cruiser luggage tags with a number at the end of the cruise in sequential order. The number corresponds to what time your luggage will be ready for you to get off the ship. These numbers are supposed to be based on your plans for after the cruise, meaning those with early flights will get lower numbers while locals may get higher numbers. Don't worry if your number seems high because you can always go to Guest Relations and get a lower number if you need it. If you need to be one of the first groups off the ship, ask to speak to a manager because it's been our experience "the squeaky wheel gets the oil", if you know what I mean. The night before your cruise is when you will have to start packing and getting ready in earnest. If you elect to have Royal Caribbean take your luggage, you need to have your luggage packed and in the hallway outside of your stateroom by a certain time (usually 11pm). Royal Caribbean crew members will take your luggage and have it ready for disembarkation so all you have to do is bring a small bag with things you cannot pack and go to the luggage pick up area once on shore. It's very important to remember to leave things you will need not just that night but the morning after. Clothes, shoes, toothbrushes, glasses and other useful things are important to have for that final morning so make sure not to pack it. Royal Caribbean crew can tell you stories about many guests who forgot to leave clothes for the next day and ended up disembarking in their pajamas. Don't be those people! Once your cruise ship docks, things will get going early. Breakfast will be available in select locations, like the Windjammer and the Main Dining Room. Once you pack up the last of your things, bring all of your belongings to breakfast and enjoy a meal before being directed to your waiting station. Each group number (the number from your luggage) has a special waiting area so you can sit down and relax. Once customs clears your ship, Royal Caribbean will begin calling numbers, with groups spaced out evenly to (try to) avoid congestion. If you are taking your own luggage off the ship, you can disembark anytime you want. The last people will need to leave by about 9am or so. It's important to note that breakfast service usually ends early, so check your Cruise Compass the night before to know what will be available. Once you leave the ship, you will scan your SeaPass card one final time before going to the port luggage area to get your luggage from an area for each number. You can optionally use a porter to haul your luggage for you (the service is free but a tip is expected). I always recommend a porter for making things easier on yourself (you're still on vacation!) and porters often get special customs lines for them that move faster. If you're new to cruising, often there's a lot of confusion and misconceptions surrounding the idea of dress codes and how formal (or informal) you have to be on your Royal Caribbean cruise. It's time to clear the air about what to wear! You don't have to dress up at all! That's right, if you want to wear shorts and tanktops all day, every day of your cruise there is no reason you cannot. 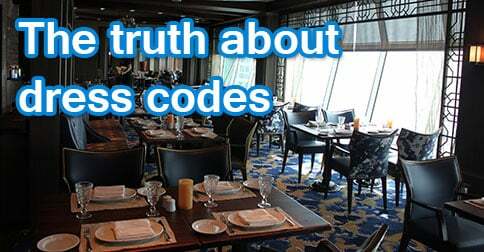 Royal Caribbean has a few dress codes that are only for dining in select restaurants. Otherwise, you can wear whatever suits you all the time. The only places you will need to adjust what you wear is in select restaurants. 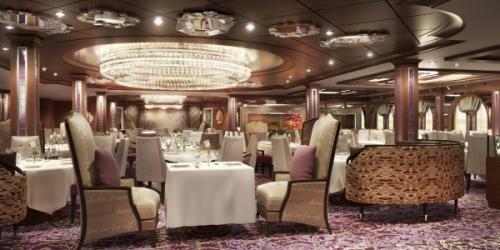 The main dining room has a dress code for every night, which is stipulated in the Cruise Compass. It varies from casual to formal and applies to dinner only. For breakfast and lunch (if open,), the main dining room has a less stringent dress code of no swimsuits, hats, tanktops or other pool clothing. The specialty restaurants always have a dress code that falls somewhere between casual and formal that Royal Caribbean calls "smart casual". Royal Caribbean defines it as, "jackets and ties for men, dresses or pantsuits for women. Other complimentary restaurants such as the Windjammer or Seaview Cafe simply require shoes and a shirt. Worrying about the dress code can be a major obstacle for those new to cruising but it really does not have to be a problem at all. Some people enjoy dressing up and others despise it and it's okay for both people. Royal Caribbean offers dress code suggestions with alternative dining venues if you choose not to dress up. In fact, a lot of veteran Royal Caribbean cruisers will tell you they really enjoy dining in the Windjammer every night for the wide variety of food and relaxed atmosphere. If you feel like packing a collared shirt and "nice" jeans and maybe a dress to have a nice night out, that's okay too. Royal Caribbean wants every guest to feel comfortable and under no pressure when it comes to what to wear at dinner. 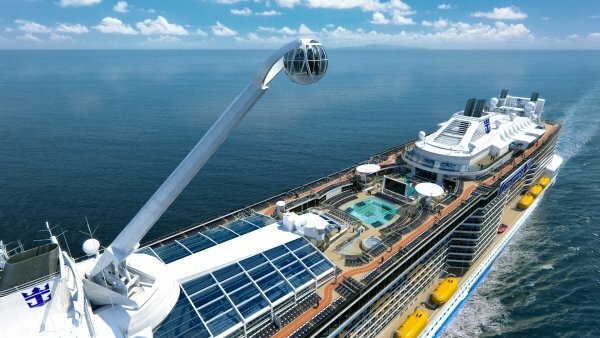 You have heard about Royal Caribbean's newest class of cruise ships coming in 2014 and 2015, Quantum of the Seas and Anthem of the Seas (there's a third, unnamed ship in that class too) and these ships are turning dress codes upside down. 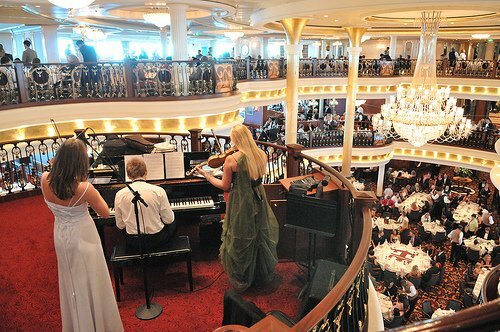 Royal Caribbean is dropping formal night dress code for ship wide recommendations. Instead, they will have one restaurant that only offers formal dress every night. A more relaxed attitude towards dress codes is also going to be felt across the entire ship. The bottom line is don't worry about dress codes. At all. They exist but they are suggestions and you will not be ostricized for not following them. There are lots of places to eat onboard if you choose not to follow them and even when you do follow them, the dress codes are pretty relaxed. Royal Caribbean ships are not full of people in tuxedos and formal ball gowns. Enjoy your Royal Caribbean cruise experience without worrying about what you will be wearing at any given time. 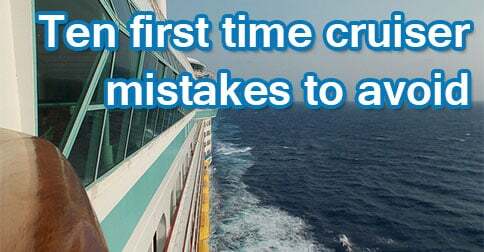 Going on your first Royal Caribbean cruise is exciting and it will likely be a lot of fun but people new to cruising can often make mistakes along the way. The good news is, you can avoid these 10 common mistakes to ensure your first Royal Caribbean cruise is awesome. Let me be as clear as I can: get yourself a passport. Cruises leaving the United States have the option for Americans to sail with either a passport or birth certificate and for those that do not have a birth certificate but if things go wrong in another country, the difference between having a passport and not having a passport is tremendous. 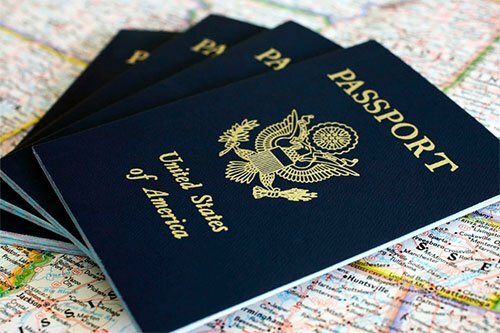 If you have a passport, you can leave that very minute to go back to the United States. Without it, you will have to go to the embassy and go through a lot of red tape to get a visa back to the country. It's not fun. When it comes to cruising, I love using travel agents because they make my life so much easier. Which itinerary you pick is important so make sure which sailing you choose is right for you. Very short sailings (3-4 nights) may be appealing but anyone who has cruised before will tell you those are just too short. Five to seven night sailings seem to be a better balance in general and give you a real sense of what cruising is like. Likewise, where you sail to is important. Try picking an itinerary that stops in ports of call that really interest you instead of just choosing the cheapest fare available. There are so many ports Royal Caribbean visits these days but make sure they are in line with the sort of activities you enjoy. The Caribbean is full of beautiful beaches while Europe is more about urban exploration. Price is not the end all, be all of choosing the right Royal Caribbean cruise but it certainly is important and the stateroom you pick out first will be important. In general, staterooms in the middle of the ship are the most desirable for their convenient location as well as least motion felt by the ocean. For first timer cruisers, staterooms in the very front or rear of the ship can save you some money but you may not find it as enjoyable being there. In addition, paying a little extra for ocean view or balcony staterooms may be worth the money for the extra space. Don't under-estimate the imporant of a few extra square feet when it comes to stateroom size. Royal Caribbean's specialty restaurants, which have an additional cost to dine there, are among the best dining locations at sea and you're missing out if you don't try one or four. You can always dine at the complimentary restaurants but working in a specialty restaurant on a few nights of your cruise can really give you a nice change of pace and exposure to cuisines that aren't available elsewhere for free onboard. Royal Caribbean's specialty restaurants are wonderful and it's hard to go wrong at any of them, so it's worth spending a little bit more to eat here a few times. Royal Caribbean has over 20 ships in their fleet and there's new ships coming online all the time but the reality is not every Royal Caribbean ship is perfect for everyone. I've loved exploring many of the ships Royal Caribbean has but there's no question in my mind the ships that are either new or recently refurbished are among the best choice for first time cruisers. The reason is the newer ships have the most new ammenities and offer the largest variety of activities onboard. For families especially, the newer ships have larger kid spaces and more for them to do. I'm a fan of the Oasis, Freedom and Voyager class specifically as good choices for first timers. Royal Caribbean offers a lot of great excursions that are easy to book and offer tremendous convenience but often it comes at a price. Booking excursions on your own can be a great way to have more choices and save you some money. We're not saying never book Royal Caribbean's excursions, but at least consider third party excursions for their tremendous value and smaller group size. Royal Caribbean adds an automatic gratuity to pretty much everything you spend onboard, from booze to spa treatments to food. When you buy something with your SeaPass card, look at the receipt before adding a tip because most often there is already a 18% tip there. And while over tipping is something to avoid, you do want to make sure that you are tipping good service, especially waiters, porters and attendants. Of course, if the Royal Caribbean crew member did a tremendous job, then please feel free to reward them appropriately! If you have to fly to your cruise, do not book your flight for the same day your cruise leaves because you're only setting yourself up for a potential problem. Veteran cruisers will always fly in at least one day before their cruise leaves and that's to avoid travel nightmares that the airlines are notorious for. Delays, weather and breakdowns happen consistantly so don't let those kind of inconveniences cause you to miss your cruise. Getting in a day early will give you plenty of time to get past any travel delays you encounter with the added bonus of beginning your vacation a day earlier!